Definition: The Hypothesis is an assumption which is tested to check whether the inference drawn from the sample of data stand true for the entire population or not. Set up a Hypothesis: The first step is to establish the hypothesis to be tested. The statistical hypothesis is an assumption about the value of some unknown parameter, and the hypothesis provides some numerical value or range of values for the parameter. Here two hypotheses about the population are constructed Null Hypothesis and Alternative Hypothesis. The Null Hypothesis denoted by H0 asserts that there is no true difference between the sample of data and the population parameter and that the difference is accidental which is caused due to the fluctuations in sampling. Thus, a null hypothesis states that there is no difference between the assumed and actual value of the parameter. The alternative hypothesis denoted by H1 is the other hypothesis about the population, which stands true if the null hypothesis is rejected. Thus, if we reject H0 then the alternative hypothesis H1 gets accepted. Set up a Suitable Significance Level: Once the hypothesis about the population is constructed the researcher has to decide the level of significance, i.e. a confidence level with which the null hypothesis is accepted or rejected. The significance level is denoted by ‘α’ and is usually defined before the samples are drawn such that results obtained do not influence the choice. In practice, we either take 5% or 1% level of significance. If the 5% level of significance is taken, it means that there are five chances out of 100 that we will reject the null hypothesis when it should have been accepted, i.e. we are about 95% confident that we have made the right decision. Similarly, if the 1% level of significance is taken, it means that there is only one chance out of 100 that we reject the hypothesis when it should have been accepted, and we are about 99% confident that the decision made is correct. Determining the Critical Region: Before the samples are drawn it must be decided that which values to the test statistic will lead to the acceptance of H0 and which will lead to its rejection. The values that lead to rejection of H0 is called the critical region. Performing Computations: Once the critical region is identified, we compute several values for the random sample of size ‘n.’ Then we will apply the formula of the test statistic as shown in step (3) to check whether the sample results falls in the acceptance region or the rejection region. Decision-making: Once all the steps are performed, the statistical conclusions can be drawn, and the management can take decisions. The decision involves either accepting the null hypothesis or rejecting it. The decision that the null hypothesis is accepted or rejected depends on whether the computed value falls in the acceptance region or the rejection region. 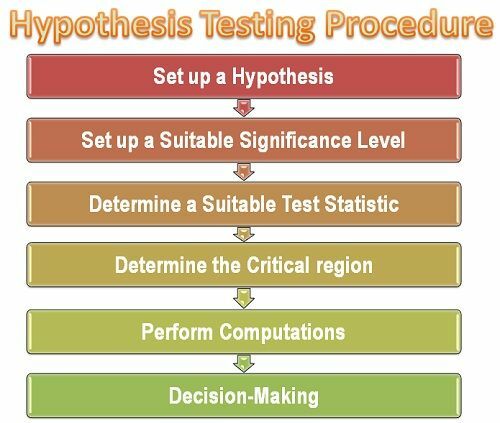 Thus, to test the hypothesis, it is necessary to follow these steps systematically so that the results obtained are accurate and do not suffer from either of the statistical error Viz. Type-I error and Type-II error.